The Education Workteam operates on a "hub and spokes" model. 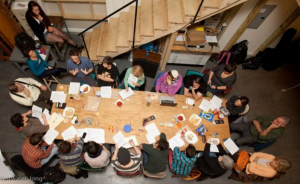 The ongoing spokes include Study in Action, Palestine / Israel 101 six week workshop offered twice a year, film/video showings, and Welcome to JVP get-togethers. 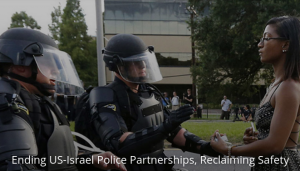 As a "spoke" of the Education Work Group, our team is offering a collective learning environment focused on the role of police and military in the US and in Palestine, looking through a lens of envisioning a world without these oppressive systems of control. Our focus is the community we are building and growing -- how we engage and support new people and long-time members to effectively be building toward justice, equity, and freedom for Palestinians and all people. JVP-Bay Area campaigns to stop 2 deadly police exchanges: those promoted by the Anti-Defamation League between US police and Israeli military and police, and, closer to home, an international war games exposition, Urban Shield, organized by notorious Trump supporter Alameda County Sheriff Ahern. Legislative work is an integral part of JVP's efforts to change U.S. foreign policy. We work both on a federal as well as local level on legislative issues relevant to ending the occupation and ending other human rights violations that Israel perpetrates on the Palestinian population. The Palestine Action Network (PAN) is a coalition of organizations and activists working on Palestine solidarity work in the SF Bay Area.